For Kathryn's birthday this year we got her a bow. She wanted one for a few reasons. I shoot one, but I doubt I'm the reason she was interested. Teenagers will things in spite of their parents doing it, not because their parents do it. I expect the real reason has more to do with a so-called Katniss Everdeen and a set of books and movies called the Hunger Games. I don't care what the reason was, I'm glad she has some interest. Archery is by far my favorite shooting sport. Guns never held my interest, not the way bows, arrows, and broad-heads did. She's still getting used to shooting, the learning curve seems steeper than I remember, but she is getting there. I'm going to make part of this a mini-review for the bow. I haven't seen too many user reviews of this one. I have seen a few video reviews done by kids. They aren't great reviews, but I'm pretty excited that there are kids out there creating things that like. This won't be a great review either, but some of the subjective thoughts from an adult may be useful if you are looking for a bow for a smaller person. I did see a few write ups and reviews from women who were using one of these as their bows. The adjustability makes it a viable option for small adults too. The bow is a Bear Apprentice 3. It is built extremely well. It is far better than the bow I owned in college in terms of fit, feel, and finish. The riser is aluminum, and feels solid, and is LIGHT. Its a dual-cam bow and is capable of throwing arrows pretty darn fast. The full specs can be found at Bear's website, but if you aren't familiar with this bow, you may be surprised. It retails for around $300 with whisker biscuit rest, a 3-pin site, and a quiver. All you need to add is a release, and a set of arrows. We also opted for a stabilizer and wrist sling. It doesn't make this an inexpensive option, but this is one of a few smaller bows that doesn't have some toy-like failings. Kathryn was pretty excited that purple was available as a color. There are a few more, and all but the black finish look sharp in my eyes. In fact, I'd have a hard time choosing between the blue, or the orange, or even the purple myself! So far, I've been pretty happy with this. Like I said, its head shoulders better than my first real bow, and in terms of actual dollars it is cheaper. In fact, in terms of nominal dollars it is cheaper. This is yet another area in which I am jealous I didn't have the same stuff available to me as a kid! I would have loved one of these! 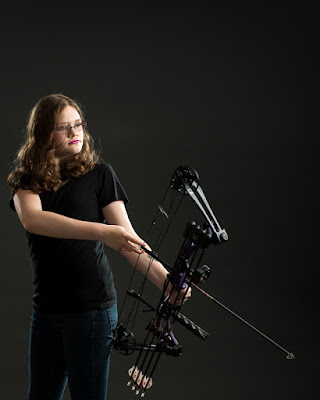 We've only had about 4 dozen arrows through this, Kathryn is still learning, and still building strength. That isn't enough time to shake out any potential problems. But there were kids at the shop that had quite a bit of mileage on theirs with no issues. If you are in my general area, I recommend Marchio's Sport Hut as a place to go check them out. If you choose to buy one there, they will set the draw length and weight of the bow, tie in an upgraded peep, and get your you headed the right direction in terms of shooting technique. I'm pretty excited about this, and look forward to shooting with her. 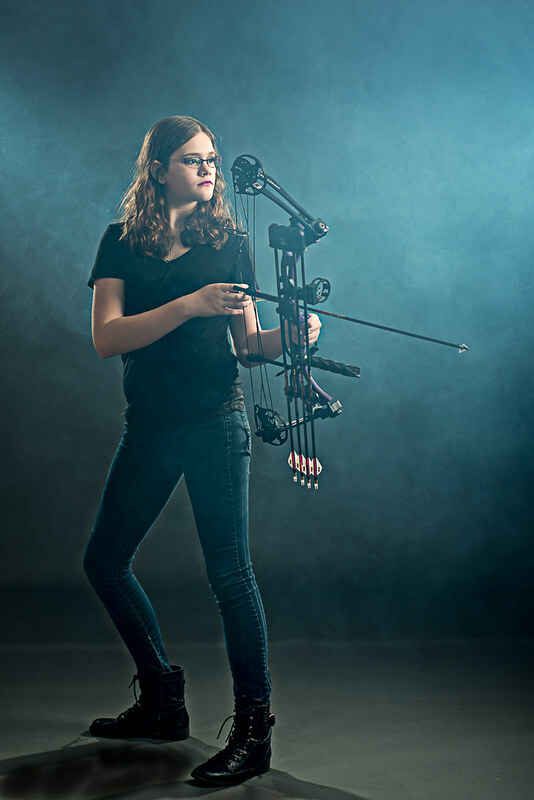 That shouldn't be too much further in the future, she just needs to internalize the "coaching" she still needs from me to get aligned correctly, not tilt the bow, and gently pull through the trigger. Our only problem, currently, with this decision is now Tobias wants one too.